Travel is hard on your body. Considering what you are doing (seeing amazing things) I know this sounds a little boo-hoo-ish, but the struggle is real. No one’s body feels good after sitting on a plane, train, or in an automobile for a long period of time. You know what I mean. Stiff neck from sleeping at a weird angle. Sore back and shoulders from sitting in the awkward seats. Tight legs and hips from the same. Hands and feet feeling heavy. The interesting thing is that you can feel much of the same after playing tourist and being on your feet all day. So what can we do about it? When we were on our girls’ trip, any time one of my friends said their legs hurt, I would say four words: legs up the wall. Usually, while I was about to do the exact same. It feels amazing when you’ve been out and about all day, or even just after a day at work. 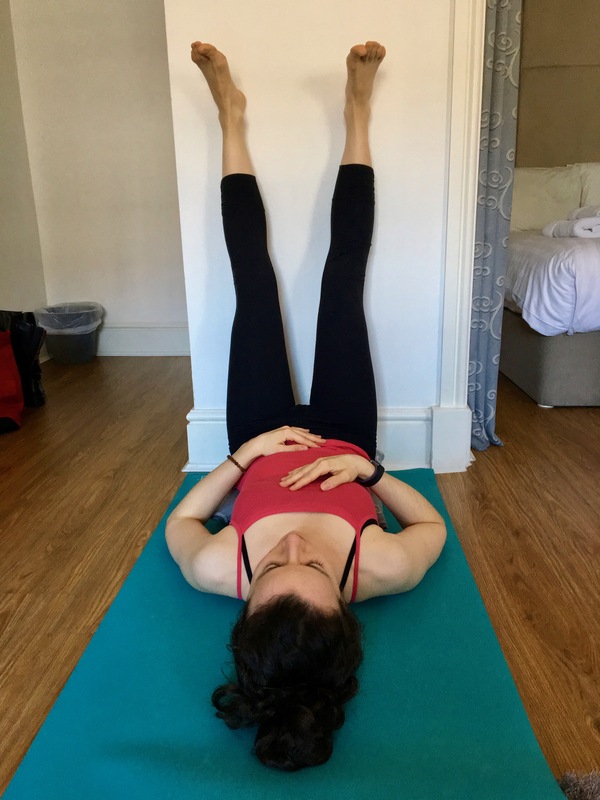 Traditionally called Viparita Karani, Legs Up the Wall is one of my all-time favourite yoga poses. It’s great restorative posture that opens the chest and stretches the back of the neck and backs of the legs. It also helps release tension in the lower back and increases circulation by flowing blood from your feet back to your heart. Your heart won’t have to pump as hard and it’s an excellent way to relax weary legs after a day of exploring and the copious amount of stairways that seem to always be part of my travels. Place your mat or towel with the short edge right against the wall. If using a cushion, place it at the wall. Lie down on your side, with your head away from the wall and knees. Sit on your mat/cushion with your left or right side flush with the wall and use your opposite hand to support you as you lie down on your side. Bend your knees as much as needed to support the lower back. You may need to scooch your hips away from the wall a bit. Arms can be by your side with palms facing up, or hands resting on your belly. Whatever is comfortable. If your neck needs some support, roll up a towel and place it so your neck can rest comfortably in alignment. If the feet get tingly, bend the knees a bit more. To feel the same circulatory benefits in your arms while in this pose, loosely extend the arms up and reach for the ceiling. To come out of the pose, gently bring the knees into the chest and roll to your left side. 5-10 minutes in this pose does wonders for my legs and my mind. I hope it can be helpful for you, too! Manduka® eKO® SuperLite Travel Yoga Mat – ($42 USD) My Kundalini teacher uses this as her travel mat, and she travels A LOT. Available online in the USA here and in Canada here. If you are wanting something a thicker, check out this very thorough and well-researched list from Reviews.com of the best mats out there. You might also want a mat bag or strap and you can find some good options here . My current home mat is a Gaiam Premium print option (available in Canada at Indigo.ca and Amazon.ca and in the US on Gaiam’s website ), and I love Halfmoon Yoga’s studio mats.